Maria Goula – Master in Landscape Architecture Barcelona – Universitat Politècnica de Catalunya – 35ª EDITION. She is a greek architect, she has been living and working since 1992 at Barcelona. At the moment, she holds a full-time lecturer position at the Department of Urban Design and Regional Planning, DUOT, School of Architecture of Barcelona, ETSAB, teaching urban design and landscape and she is the Head of the Master’s in Landscape Architecture (adapted to the Bologna Agreement) since March 2009. 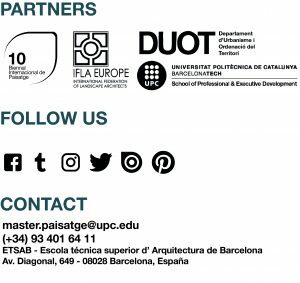 She participates in the Direction of the Centre of Landscape Research and Design of Barcelona, CRPPB, having been one of its foundation members since 1994. From her recent works can be emphasized the elaboration of the Catalogue of the landscapes of the regions of Lleida and that of Girona, Catalonia, both of them commissioned by the Landscape Observatory of Catalonia. She performs as scientific consultant in the research project: Greek scapes; research project for the interpretation of the Greek landscapes. Research project funded by Latsis foundation, Greece, and is member of the winning team led by A. Zahonero, M. Van Gessel, A. Vidaor, for the Competition Green Corridor Park in Cerdanyola, October 2009. She won the 2009 Extraordinary Quality Award for the PhD in Architecture with her thesis “the other landscapes: readings of the variable image”.